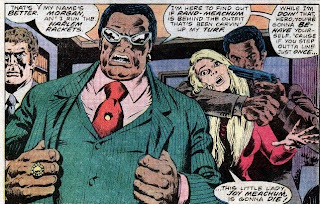 Last time, my exploration of the history of Iron Fist ended with him partnering up with Luke Cage, also known as Power Man. 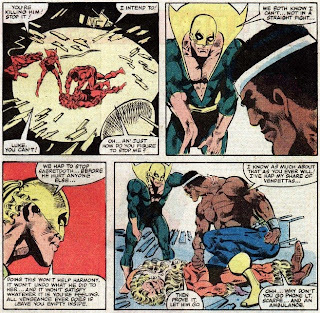 Power Man and Iron Fist is one of those beloved series that fans still talk about to this day, and Marvel periodically tries to resurrect it in various forms, with little success. 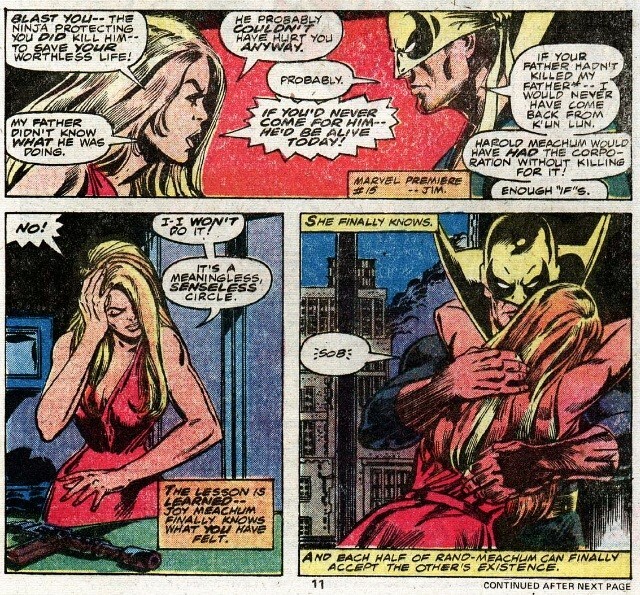 (I’d love to see Marvel do a retro series set in the ‘70s, continuity be damned.) They were the perfect odd couple, yet you really believed that they were the best of friends. 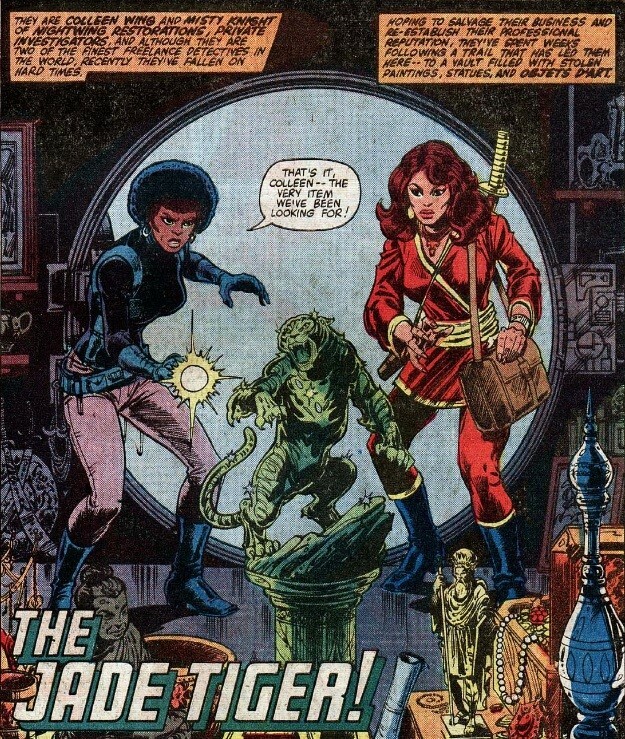 Add in plenty of supporting appearances from Misty Knight and my beloved Colleen Wing, and you have the recipe for a dynamite series. Now, I’m not crazy enough to try and cover the entire series. Reading all those ROM comics nearly melted my brain, and I need my brain. I still use it from time to time. So what I am going to do is highlight a few key moments, and take a look at some issues I picked out that look like they might be entertaining. Enough wasting time with my meaningless rambling, let’s get started. This panel made me laugh. Joy Meachum makes a return appearance as a hostage. 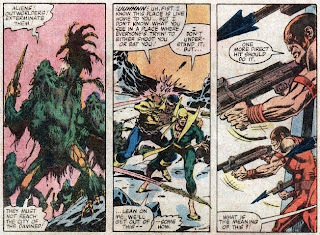 My brain thoughts: Despite all evidence to the contrary, my favorite artist of the ‘80s was not John Byrne, but Mike Zeck. This must have been early in his career though, as it looks nothing like his eventual signature style. 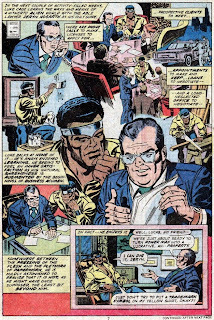 That, or his pencils were overpowered by the inker, Ernie Chan. If I had to guess, I’d say it was a combination of both of those elements, with an inexperienced penciler and an inker covering the gap for him. Jim Shooter was the editor on this issue. (Shooter gets a bad rap for being a bully and an egomaniac, but I don’t care, I refuse to believe it. He presided over the greatest era of storytelling in Marvel comics history, which means he basically presided over my childhood. No, I am not biased in this, why do you ask?) 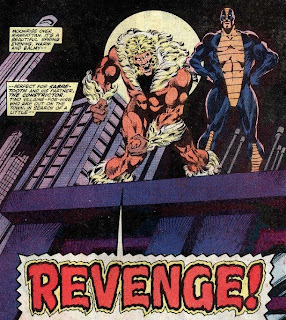 This is Chris Claremont’s last issue as a full scripter. 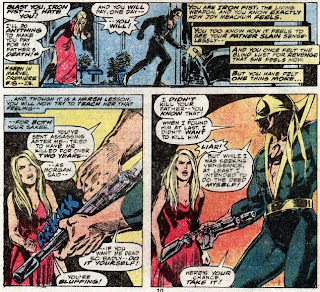 Iron Fist and Joy Meachum finally have their final confrontation over his role in the death of her father. She finally accepts the truth, or at least understands where he’s coming from. 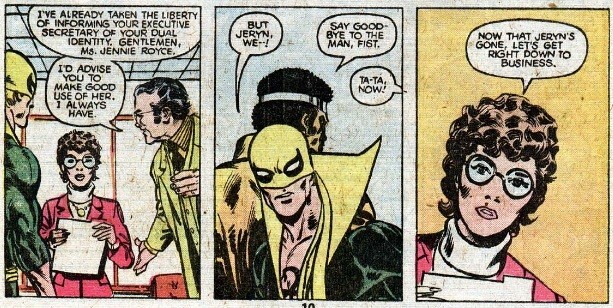 My brain thoughts: One last dangling plot thread from the Iron Fist series is resolved, which is good because I think Joy could be an interesting member of the cast. Unfortunately, I don’t think this ever happens. 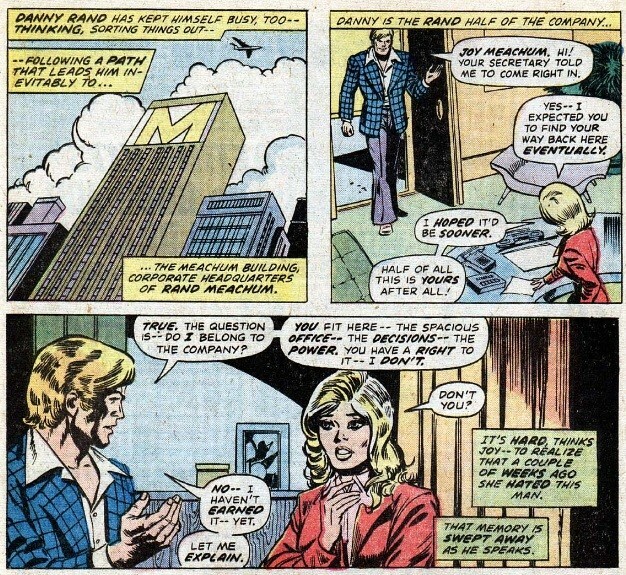 Misty gets mad that the boys are going to leave her behind because she got injured, and threatens to fire Luke from Nightwing Restorations. 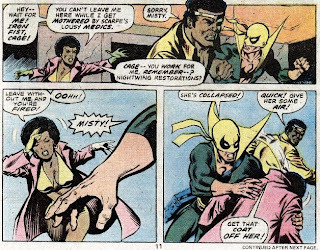 After defeating the bikini-clad villainess (the best kind) Nightshade, Luke comments on how he and Iron Fist make a pretty good team. 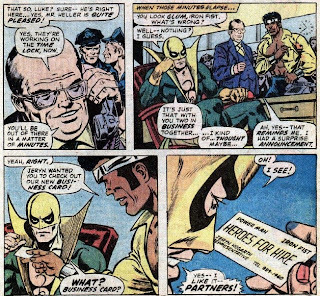 Jeryn Hogarth thinks the idea of a “Hero for Hire” is a brilliant one. 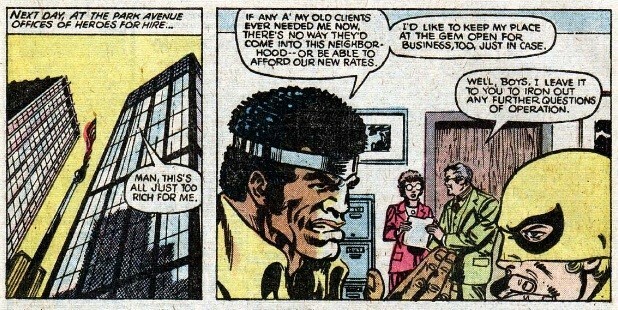 He takes Luke Cage under his wing, teaching him to be a better businessman. 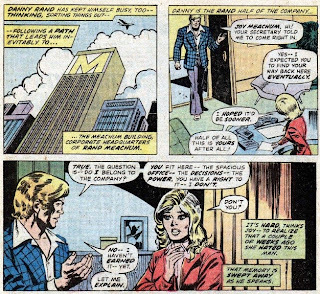 Danny visits Joy Meachum, and decides to turn over his controlling share in Rand-Meachum to her. She will run the company until he decides he has earned his place in it. Danny is feeling a little left out thinking that Jeryn and Luke are going to be working together, until he sees the new business card. 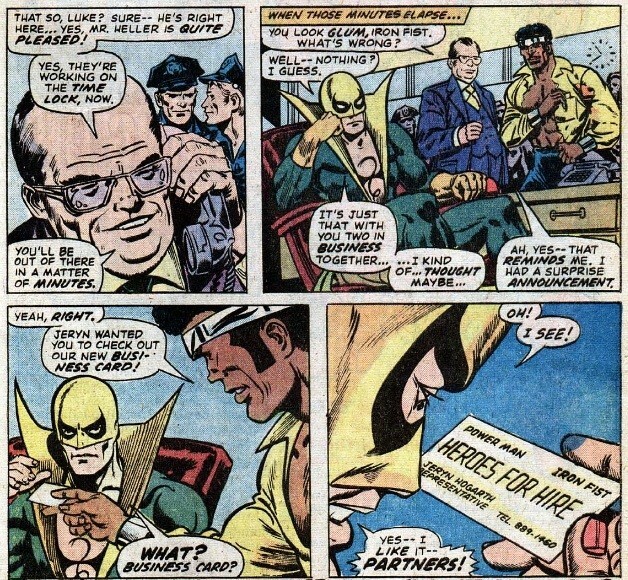 My brain thoughts: The official birth of the new Heroes for Hire team. 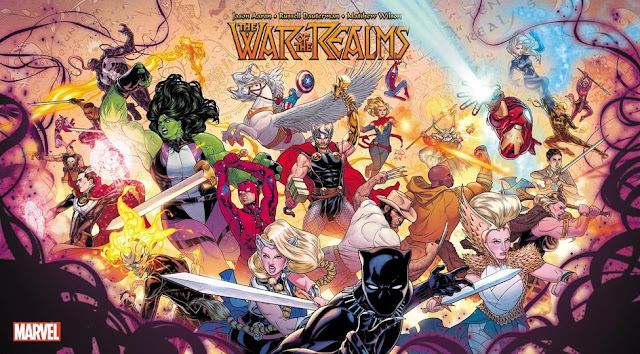 This is a concept that Marvel has tried to resurrect over and over again, but has never been able to do with any kind of sustained success. The main problem being (as I see it) that they’re always trying to include too many characters. 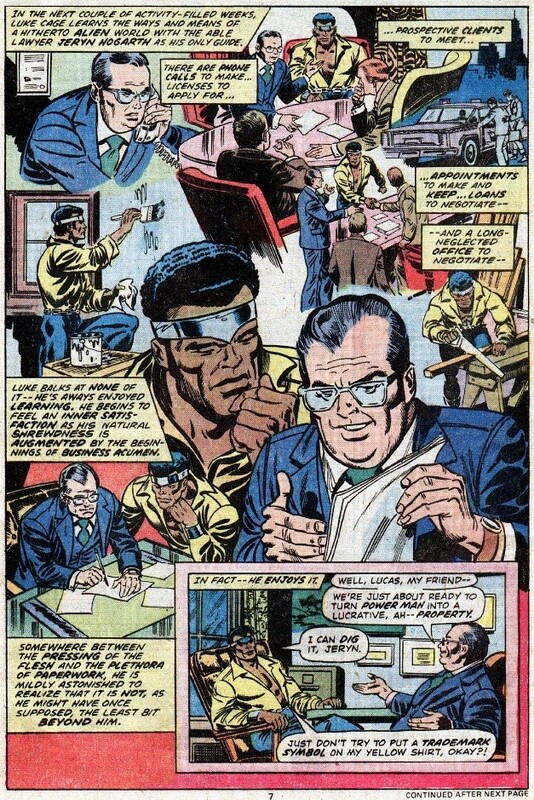 The concept worked because of the chemistry and dynamic between the characters of Power Man and Iron Fist. That’s what worked. Not some kind of blanket high concept of heroes that work for pay. 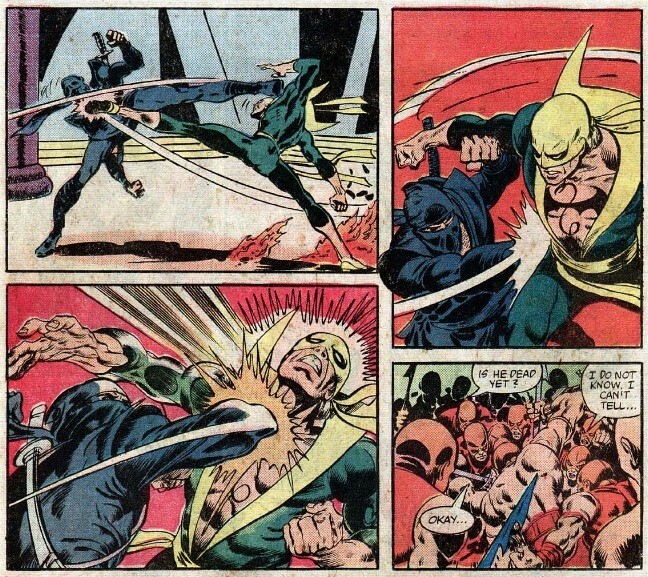 Iron Fist tutors Luke Cage in the martial arts. …and meet their executive secretary, Ms. Jennie Royce. Luke Cage struggles with Danny’s inheritance and wealth. My brain thoughts: Finally some stability as Mary Jo Duffy sticks around for a while as the writer of the book. The art style is still a little too crude for my tastes. New offices and a new secretary serve to continue building that world for the book to exist in. But the book has been suffering from a serious lack of Colleen as of late. 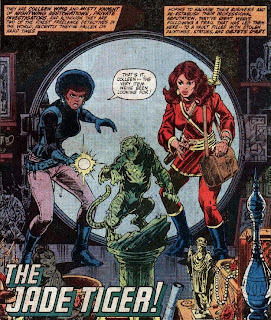 Misty and Colleen—also known as the Daughters of the Dragon—were hired to recover a stolen jade tiger for a client. 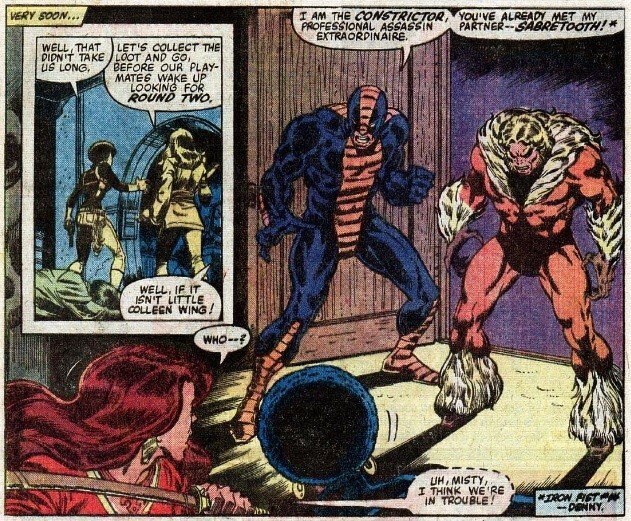 They track it down to a warehouse, a warehouse that is guarded by the Constrictor and Sabretooth. Misty is trapped in a giant vault, and Colleen is injured while escaping. 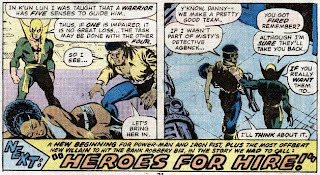 Colleen returns to the warehouse with Power Man and Iron Fist. While Power Man faces off against the Constrictor, Iron Fist has a rematch with Sabretooth. Both heroes prevail, and the police are called in to take control of the warehouse and all the stolen goods inside. My brain thoughts: Kerry Gammill was the regular penciler on the book by this point. While not up to the level of a Byrne, the art is still a great deal better than it has been. 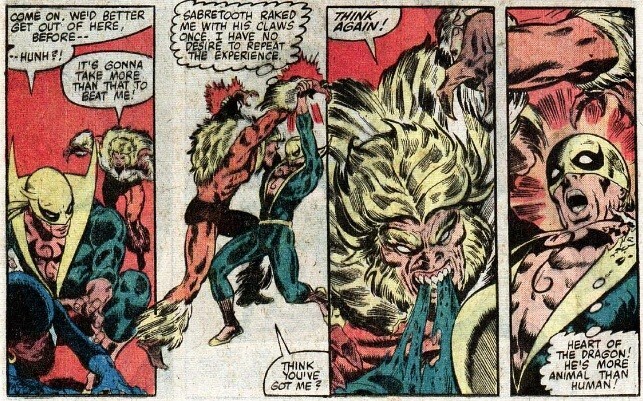 This was the second appearance of Sabretooth. 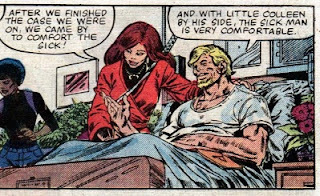 It’s funny how he started off as a second-rate Iron Fist villain, until (I assume) Claremont reclaimed him for the X-books. 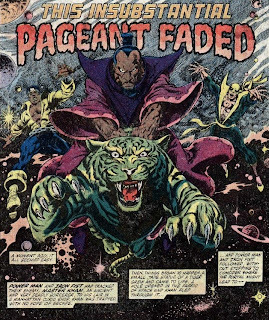 Power Man and Iron Fist go tumbling through a dimensional portal after Master Khan, riding a jade tiger. 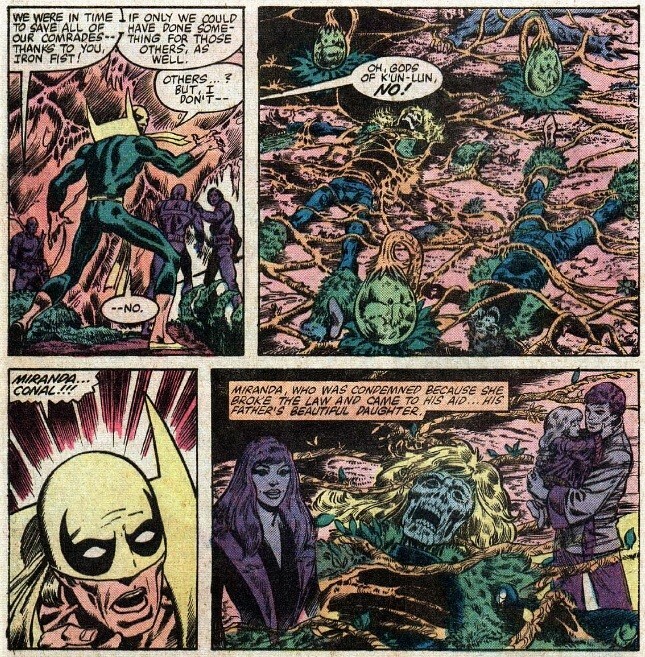 Iron Fist is shocked to discover they have been transported to K’un-Lun. They are trapped in the crossfire between K’un-Lun bowmen, and the H’ylthri planet creatures. Both of them make it safely inside, where they are welcomed by Yu-Ti, the August Personage in Jade. They are invited to clean up and join him for dinner. At dinner, Danny requests for Yu-Ti, his uncle, to tell them the full history of his family. 30 years ago, Yu-Ti and his father Tuan had been cornered by Shou Lao the undying. 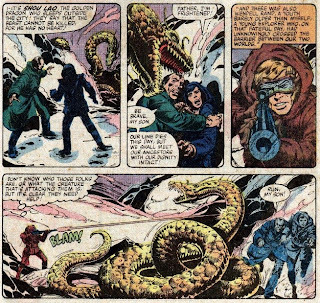 A young explorer named Wendell Rand had unknowingly crossed the barrier into K’un-Lun, and was able to scare the dragon away. While saving their lives, Wendell was gravely wounded, so they brought him back to the city. He was tended to by the “fairest of our city’s flowers”, a woman named Shakari. Tuan adopted Wendell as his son and heir, and gave him the gift of immortality. Wendell and Shakari had also fallen in love, much to the chagrin of a jealous Yu-Ti. Wendell and Shakari eventually had a daughter, that they named Miranda. One day while outside of the city, Shakari was killed by the H’ylthri. Wendell, overwhelmed by grief, returned to the outside world, never to be seen in K’un-Lun again. 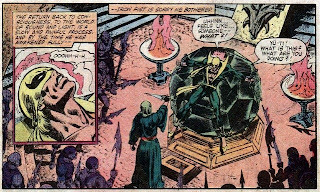 Back in their private quarters, Iron Fist recalls the events that led him to K’un-Lun, and gaining the power of the Iron Fist. He recalls how his friend Conal and his (unknown to him at the time) sister Miranda were captured by the H’ylthri, days before he was to depart the city. The next day, Iron Fist and Luke prepare to lead an army of warriors out against the H’ylthri. They encounter a group of H’ylthri warriors, and a spectacular battle ensues. Many K’un-Lun warriors are killed and captured. Iron Fist refuses to give up, and leads the remaining warriors after the H’ylthri. They track them down to their main citadel, and the battle begins anew. 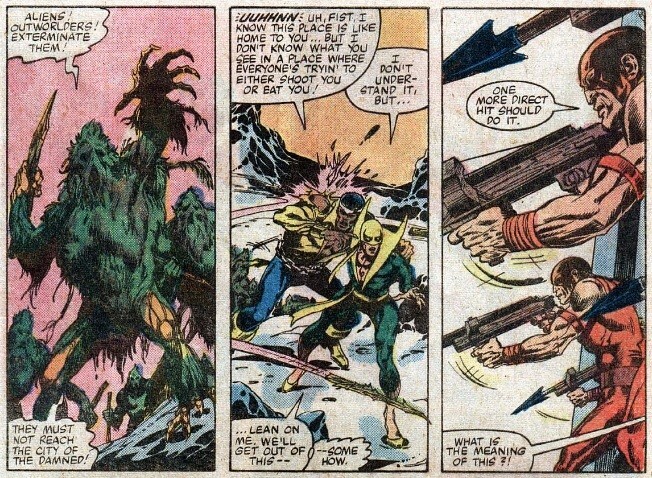 Iron Fist locates the captured warriors, and discovers that the H’ylthri use mammals as food for their children. He investigates deeper, only to find the skeletal remains of Conal and Miranda. That night, the city of K’un-Lun celebrates their massacre of the H’ylthri race. Luke passes out from drinking wine, and Iron Fist is ambushed from behind. Danny wakes up to find himself tied to the great crystal. Yu-Ti has made a deal with Master Khan. 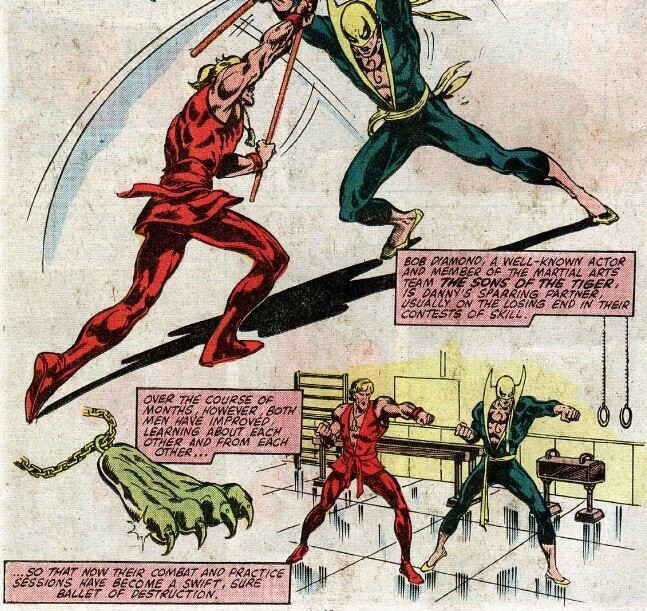 He intends to offer Iron Fist up as a blood sacrifice. 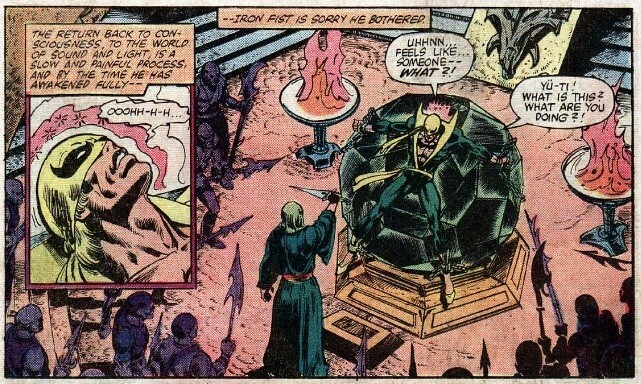 The rulers of K’un-Lun had always relied on blood sacrifices to keep the city safe, since no one had ever successfully earned the power of the iron fist (this would be ignored in Immortal Iron Fist). Shou Lao had been the focus of Master Khan’s power until Danny defeated the great beast, and he intends to get that power back. Lei Kung rouses Luke from his drugged slumber and they run off to save Danny. 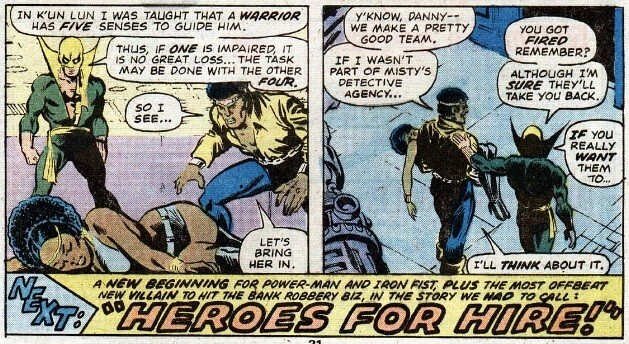 Lei Kung is injured, leaving Power Man to take care of Yu-Ti’s warriors. Iron Fist battles the ninja, newly re-conjured by Master Khan. 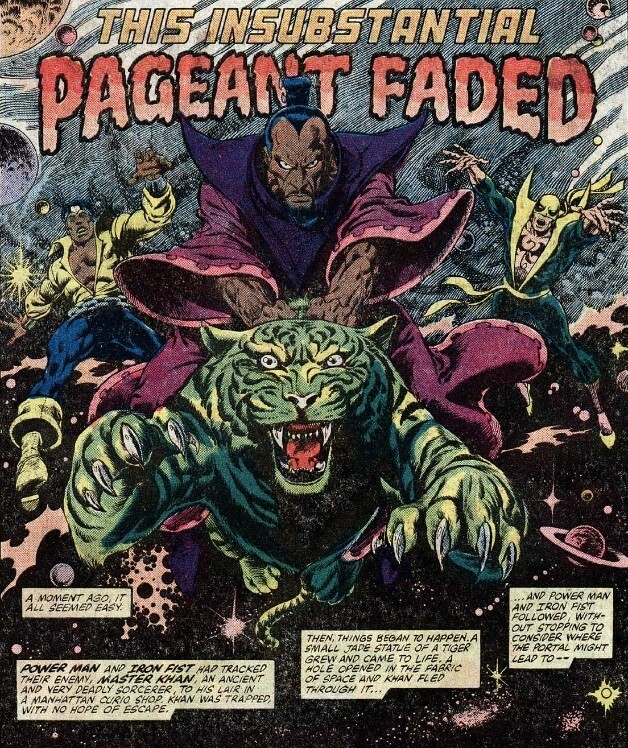 Power Man and Iron Fist defeat their enemies, and converge upon Master Khan. Master Khan pleads with them to spare him, and in exchange he will return them home. 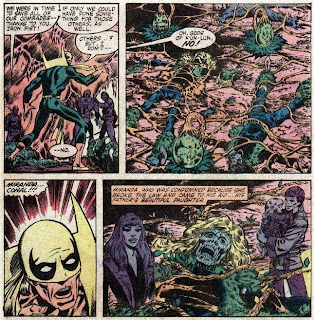 They reluctantly agree, but before leaving, Iron Fist smashes the great crystal into pieces, forever breaking the link between K’un-Lun and Earth. They offer to bring Lei Kung with them, but he declines, choosing to stay behind. 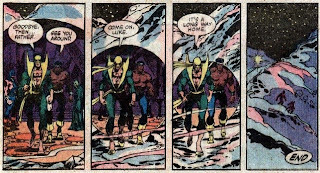 Iron Fist and Luke walk through the portal as it slowly closes behind them. My brain thoughts: I knew the H’ylthri and Miranda would return, and I’m not quite convinced we’ve seen the last of either. 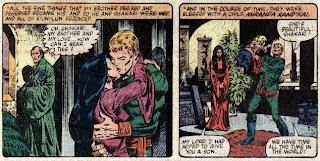 This finally answers some more of the lingering questions about the Rand family, and Yu-Ti’s sinister intentions. 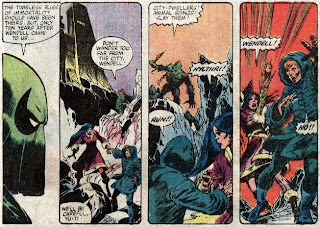 It seems odd that they would agree to Master Khan’s deal and just leave, but they were running out of pages in the issue so they probably wanted to wrap things up quick. There is someone out on the streets attacking women. 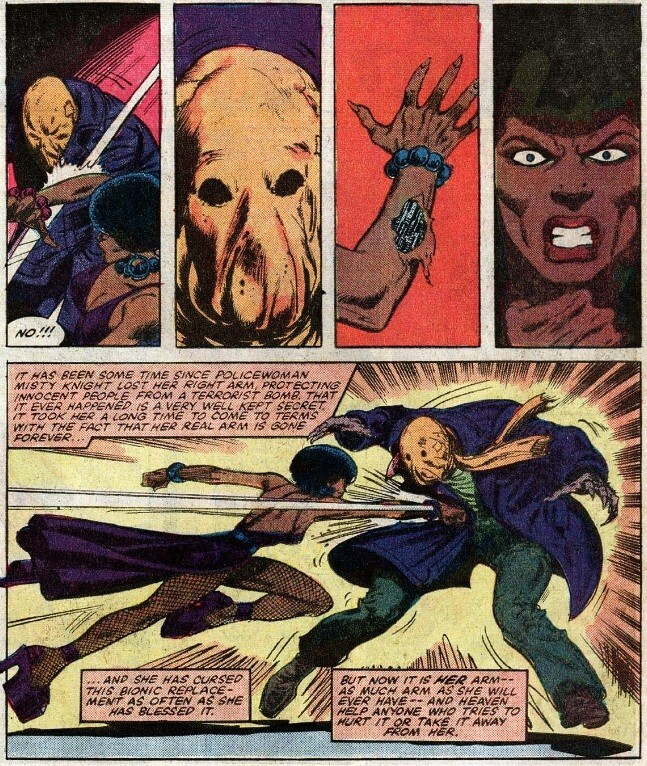 He has been dubbed “the Slasher.” After dropping off a woman they rescued at the hospital, Luke runs into former flame Claire Temple. Misty and Colleen go undercover as “working girls” in an attempt to draw him out. Misty catches the Slasher mid-attack. 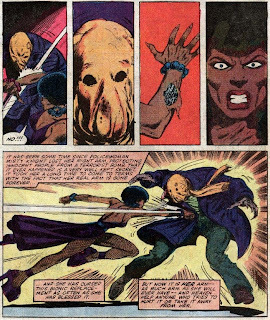 They struggle, and the “skin” on Misty’s bionic arm is ripped. She gets angry, and lets loose with a massive punch to the Slasher’s midsection (nice shoes Misty). The Slasher escapes with a man named Frank. Luke is torn between his current girlfriend Harmony, and the feelings he still has for Claire. Sabretooth is out for revenge against Misty Knight. Turns out he was the Slasher, and he didn’t appreciate how Misty ended up taking him out of commission for a while. 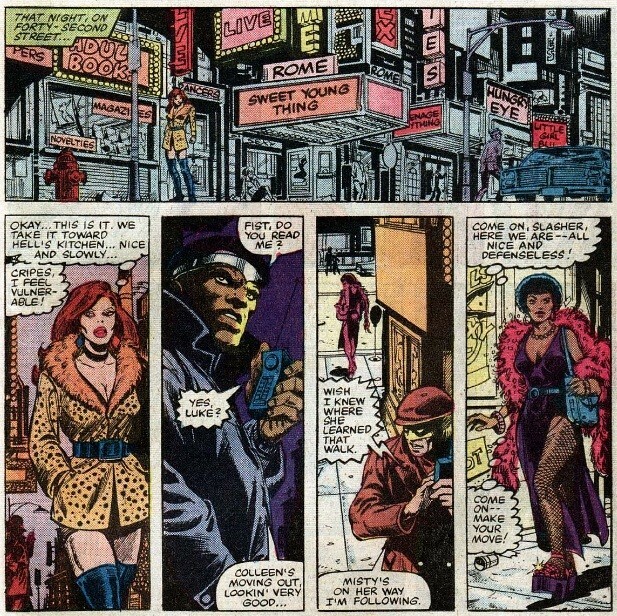 He tracks down her apartment, but accidentally attacks Luke Cage’s girlfriend Harmony instead (she had borrowed Misty’s perfume). Iron Fist, Misty, and Colleen are able to chase him off, but not before Harmony is seriously wounded. Luke Cage is out for blood. 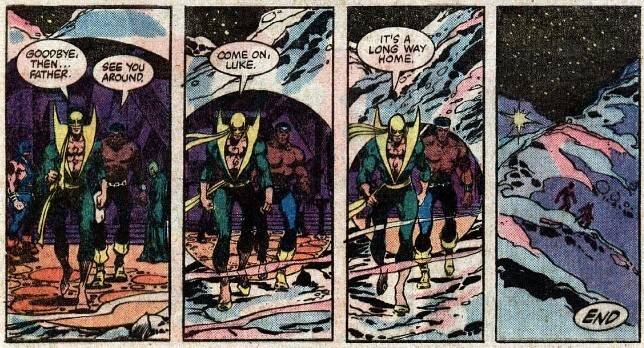 He and Iron Fist track down Sabretooth and the Constrictor to a jazz club. 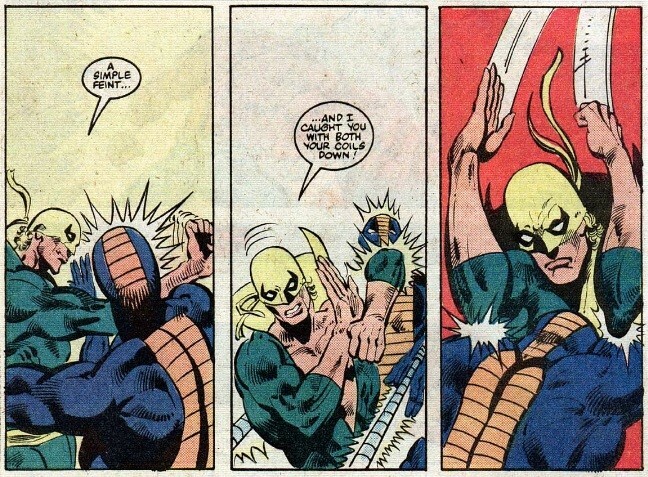 Iron Fist takes care of the Constrictor. 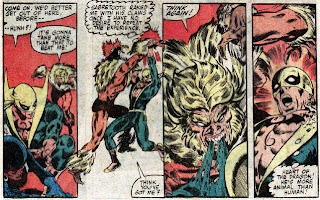 Luke Cage has to restrain himself from choking Sabretooth to death. 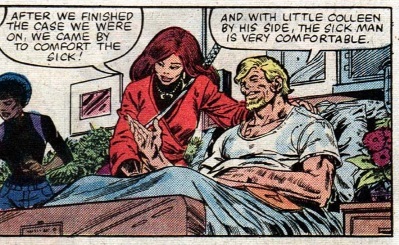 In the end, Luke Cage professes his love to a recovering Harmony. 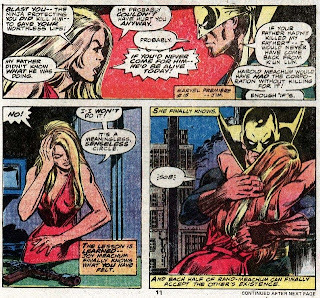 My brain thoughts: Luke Cage has been quite the player so far in this series, even trying to reconcile with Claire in this very issue before he hears about the attack on Harmony. It will be interesting to see if his feelings will last. The end of Power Man and Iron Fist contained one of the most disappointing and heartbreaking moments of my young comic book reading life. We’re getting closer and closer to that moment, so stay tuned.